Woohoo! October! The dance of joy and maybe the most beautiful month of the year. After the cold front rolls through tonight maybe we can get past these crazy mornings with fog and settle into some real brilliant fall weather, they are calling for 40 degrees on Sunday morning here! Fall chores are beginning to get checked off the list. We uncovered the Big Tops for the winter this last week, the farm always looks smaller when they are not looming at the top of the hill. Almost all of the summer crops have been mowed and I need to get on the tractor and start getting soil ready for this winter and next year. While we are not done for the season like we used to be, things are slowing down and this is when Jennie begins to take over as the responsible party. It is great relief to have her here and know that Betsy and I can get started a little later each morning because she has the plan for the day and will carry it out. 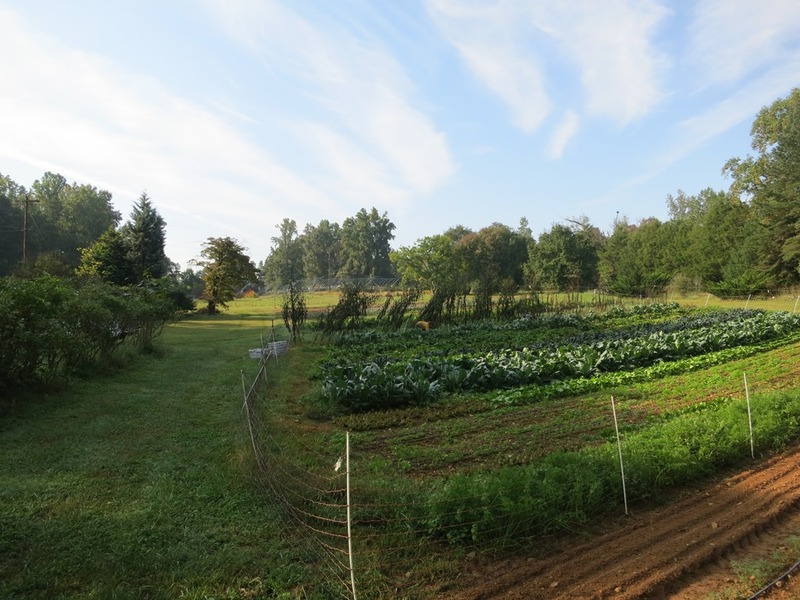 The Market Perennial sustainer program has kicked off well and the link to be able to sign up and donate online is now live. With just a bit of additional help from the community the market will be able to expand our food outreach and education programs and continue to keep the market a leader in farmers’ markets around the state and country. Peppers slowing down a bit more but still plenty with Red Bells and some yellow too. Red, yellow and orange Corno di Toros. Peppers with little or no heat- Shishitos and Padrons for appetizers and Aji’s, the habanero without heat. In hots fewer Poblanos, Anaheims but plenty of Jalapenos, Serranos, Cayennes, Picante Pimentos and a few Pasillas, Piquillos and Espelettes. Greens season again with beautiful Lacinato Kale and Yukina Savoy, a really tender spinach like green. Roots too with tender white Japanese Turnips, Easter Egg Radishes and the first Watermelon Radishes of the fall. Beets are back with all three types Red, Golden and the striped Chioggia. The last of the Sweet Red Onions, get them while they last. Cilantro. A few more of both the Nubia and Italian heirloom Eggplants. Bring on the winter squash, goes with that snow theme- Spaghetti Squash, Butternut, Acorn and Sweet Dumpling; they go great with chiles! First Baby Ginger of the season and it looks great! The flower department is down to a ton of Celosia with felt like heads and the radiant plume type, probably the last of the season. Asiatic Lilies make a late season appearance too. Limelight Hydrangeas.